In January 2013, Laurent Polito won the World Poker Tour National Paris for €74,500, and a little over a year later he captured his second WPTN title by taking down the 2014 PMU.fr World Poker Tour National Cannes for €86,000. 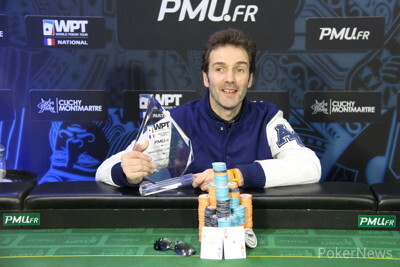 Amazingly, Polito took down his third WPTN title this week when he topped a field of 682 entries to win the 2014 PMU.fr World Poker Tour National Paris for €140,000. 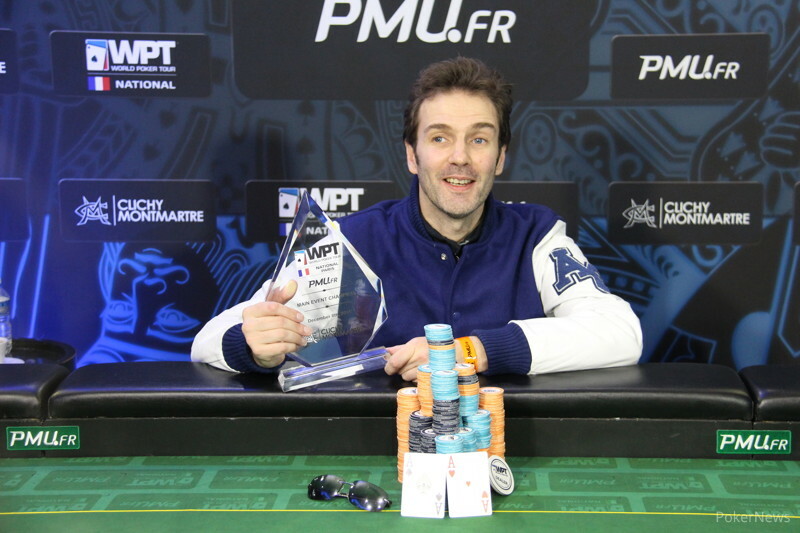 By defeating Carlo Savinelli in a short heads-up battle, Polito was able to capture the WPTN Paris title for the second time in three years. The fourth and final day of action saw 14 players return to take a shot at the title. The final table of nine was reached fairly quickly as first Faouzi Degachi was eliminated in 14th when he lost a flip with against the of Tarek Bouchama. Claudio Leonardi was next out when he shoved the flop with but lost to the flopped straight of Guillaume Wilhelm holding . From there, Thierry Luksenberg was short and shoved into the of Carlo Savinelli and was the next to be eliminated in 12th after he failed to improve. Wilhelm claimed another victim when he called a three-bet shove holding from Mohamed El Bakkouri who was dominated with . Tarek Bouchama was out in 10th when he shoved with on a flop and was called by the of Alexandre Pereira Gama. The turn and river were no help and that left nine for the unofficial final table. It took a while to lose the next player and it would be short stack Nathalie Schaeffer, who played a patient game all tournament. However, her shove from the small blind with ran into the of Savinelli who stayed in front to bust her and set up the official final table of eight. When the final table resumed they were to lose three players in quick succession. Omar Lakhdari was the short stack at the table and he picked a spot to three-bet jam over Franck Kalfon’s open with . The final board was and Lakhdari was out in eighth for €18,000. Kalfon was the next to go in seventh place. It happened in a cruel fashion when Stephan Ouzilou opened for 195,000 with and Gama called with . Kalfon moved all in for 1,030,000 with , and when Ouzilou folded, Gama made the call.The cards ran out and the jack on the flop gave Gama a set and sent a crushed Kalfoln to the rail with €22,500 for his troubles. It wasn’t long before Ouzilou became the sixth-place finisher and it would be another big pair that brought about his downfall. Opening with he called the shove from Wilhelm, who had . The turn shot Wilhelm in front as the cards fell , and Ouzilou was crippled. A shove with minutes later saw Gama call with the to finish him off. Ouzilou collected €28,000. David Lascar was the short stack at that point and decided to shove with after an open from Savinelli, who called with . That didn’t work out and Lascar walked away with €35,000 for fifth place. Gama went out in fourth for €45,000 when his ill-timed four-bet shove with the was called by Polito, who had three-bet with the . The cards couldn't help as they came out to set the final three. Polito continued to pick up good hands and frequent pots at this point and extended his lead, which was instrumental in finishing off Wilhelm. Polito opened for 250,000 with and Wilhelm moved all in for 1,030,000 holding the . Savinelli called with and Polito put in calling chips too. The flop of gave Wilhelm hope, though Polito tossed out a bet on the turn . Savinelli folded and the river sent Wilhelm home in third place for €61,000. A deal was discussed during heads-up play, but Polito eventually declared, “No deal.” He had most of the chips and it was clear he wanted all of the money too. From there Polito ran good and used his stack to better effect. Savinelli could do little to fight back and indeed barely won a pot worth mentioning. It was all over in just half an hour with the final hand occurring with Savinelli moving all in with the and Polito snap-calling with the . The board ran out a clean and Polito went to celebrate with his ecstatic supporters. After four days of gruelling poker Polito had finally done it. He led from Day 2 and played fantastic poker, barley putting a foot wrong, and was rewarded with €140,000 and an unbelievable third WPT National title. A recap of the day will follow shortly. Carlo Savinelli moved all in with and was instantly called by Laurent Polito who was dealt . The final board read . As the turn card hit Savenelli was drawing dead and Polito was in the arms of his jubilant rail, savouring the moment of victory before returning to congratulate the defeated Savenelli. A short heads up that Polito dominated in every way was over and Savinelli was the gracious runner up. Win a Brand New FIAT and Travel Package with the WPT! ClubWPT and FIAT® are teaming up to bring you an exciting tournament series where the champion will win their very own wicked 2015 FIAT 500 Abarth Automatic, $500 cash, and a World Poker Tour® VIP experience. Qualification started on Oct. 1, 2014 with tournaments running every day. ClubWPT will pay for travel expenses and fly the winner to a WPT® tournament during Season XIII in 2015 to accept their prize during the filming of a televised World Poker Tour event. Check out the tournament structure to learn more about some of the ways you can qualify to play in the FIAT Final on Sunday, Jan. 25, 2015. 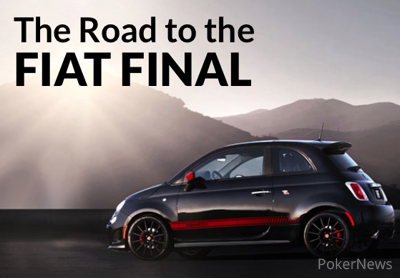 Do you have what it takes to travel The Road to the FIAT® Final? NO PURCHASE NECESSARY. Promotion begins on Oct 1, 2014 and ends on Jan 25, 2015. Must be 18 or older and a resident of one of the States or countries listed at www.clubwpt.com/prize-eligibility, excluding Florida. The Grand Prize winner will be required to appear at a televised WPT Season XIII event selected by Sponsor. See Official Rules at www.clubwpt.com/fiator for eligibility restrictions, qualifying information, prize descriptions/restrictions/ARVs, and complete details. Void where prohibited. 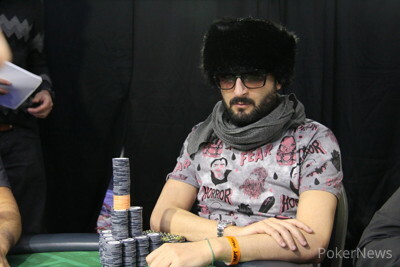 Carlo Savinelli shoved with and took a rare pot from Laurent Polito. Laurent Polito is continuing to pick up nearly all the pots. Laurent Polito opened for 250,000 with and Carlo Savinelli called with . They checked it down to the river on a board of . Savinelli showed his pair first but it was once again second best to Polito.